You may argue with Management professionals that investors invest because they want better returns. An investor weighs his investment options, considers his risks profile et al and make a decision of investment expecting certain returns, right? But I think we are living in a time when many of us are thinking and should think about what bigger return based investment we can make and how can we reduce risk. Risk of the society! A couple of months back a twitter handle @nonprofitcoffee followed me. It sounded strange, so I visited the handle, eventually the website. I was impressed and thought to write a blog on the same. Three avocados is a Non for profit company operating out of Uganda. Their product is coffee, order from here. Avocados and coffee does not gel well together, right? The company is named so because a destitute widow gifted three avocados, the only possession she had, to the founders of this company when they visited a village. This business has a purpose, not the cliche – to increase “shareholder” value. The purpose is different than many other businesses. They want to help Central African country – Uganda – with clean water. Young girls and women have a responsibility in their homes, the responsibility is to collect water for their daily chores. Well this is the story of many Indian villages as well. So can we think of such an initiative in India or other parts of the world? There are many social issues to handle e.g. women security in Delhi (just an example). 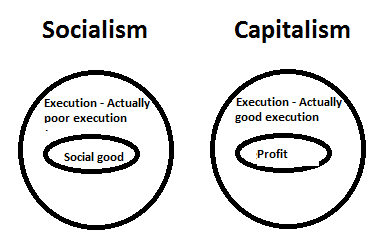 Businesses are made for profit making, is there a question in this assumption or argument? For the time being, I am assuming there is no doubt about the argument that business exist for making profit. I have been thinking about the topic of “measuring growth” I wrote recently. People may say there are businesses as “Not for Profit Businesses”. This concept of “Not for Profit” in many cases is about reinvesting profit in business rather than giving dividends to the shareholders/investors. There are other businesses which are “social enterprise”, I wrote on such businesses with reference to a book “I have a dream”. These are businesses which exist for making profit; however their primary reason of existence is social upliftment with moderate profits. I wanted to ask myself – why not all For Profit Business be like that? In my previous career engagement, a couple of times I had a chance to meet CMO of a big Mutual Fund house. In one interaction he told my boss – “you do X, Y and Z; Calculate your cost; add your 20% profit on that and charge me. I need this X, Y and Z done.” This statement was very liberal to hear. I had seen many organizations trying to squeeze their service provider. Thus the statement became a guide for me to think about such clarity and about fair co-existence. I relate the same to the previous post of “measuring growth”. When I tried understanding Islamic banking and asking the feasibility of the system, I saw contrary view points. I read somewhere Islamic banking does not call “interest” (on debt) as interest whereas terms it as profit sharing (say 20%). So there may be businesses so clear and there could be predictability in cost, profit and growth of business and economics. This kind of approach is very simple. However, the above case is very simplistic and everything (many things) would become very predictable – how would finance experts – involved in complex transactions and certificates – would be able to manipulate market? There can still be demand and supply gap and market may run into a relatively predictable and stable equilibrium.